(CNN) - Natalie Tennant is making it clear: she opposes President Barack Obama's policies on coal. "Where do they think their electricity comes from?" asks West Virginia's secretary of state and Democratic Senate nominee, as her new campaign commercial shows a picture of the White House. "You and I know it's our hard-working West Virginia coal miners that power America. I've fought to protect our coal jobs right alongside Joe Manchin, and I'll stand up to leaders of both parties who threaten our way of life, I'll make sure President Obama gets the message," adds Tennant, as she pulls a power switch which turns the lights off at the White House. Tennant's campaign says they'll spend six-figures to run the spot for two weeks in four markets that cover three-quarters of West Virginia. The ad is the first by Tennant or her Republican opponent, seven-term Rep. Shelley Moore Capito, who is considered the favorite in the race. The winner in November's midterm elections will succeed longtime Democratic Sen. Jay Rockefeller, who is retiring after three decades in the Senate. Tennant opposes a proposal by the Obama administration to limit carbon emissions from coal-fired power plants. The Coal industry is a major employer in West Virginia, as well as neighboring Kentucky, where Democratic Senate nominee Alison Lundergan Grimes, a fellow secretary of state, is also knocking the White House over its stance on coal. Tennant also touts in her ad that she stands with Manchin, a popular moderate Democratic senator and former West Virginia governor. Manchin also took aim at the White House, running a well publicized ad during his successful 2010 bid for the Senate in which he loaded a rifle and literally shot a hole in the President's proposed federal cap and trade bill. Capito's campaign has tried to link Tennant to the White House and to congressional Democratic leaders like Senate Majority Leader Harry Reid and House Minority Leader Nancy Pelosi. Last week a release from the Capito campaign called Tennant the "new darling of anti-coal extremists." 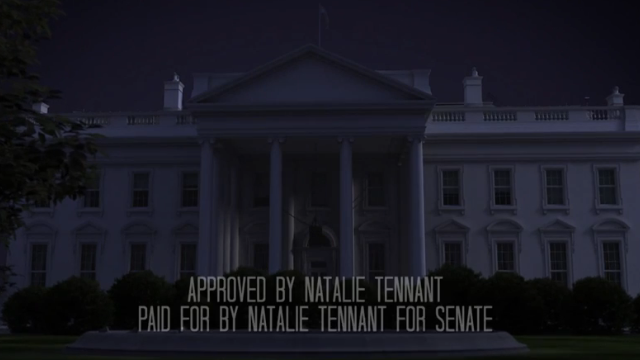 Responding to the new ad, the Capitol campaign said that "Natalie Tennant isn’t fooling anyone by claiming she’ll stand up to the White House. She helped Obama get there in the first place. This ad reaches a new level of hypocrisy for Natalie Tennant." "Where do they think their electricity comes from?" asks West Virginia's secretary of state ? As if coal is all there is to create energy . There is no such thing as clean coal . Yes, West Virginia voters, vote for Democrat Tennant and your family's demise, such a great plan. Democrats must think you are really, really dumb. Or vote for a Republican who will shut down OBAMA and not your job. Thanks for the Senate seats Obama!! They do have tough choices to make. The path to the left leads to a return to the stricter emissions regulations that were in place prior to Bush-43. This path tries to protect the rights of workers, their wages and pensions, and ensure safer working environments. The path to the leads to further deregulation of emissions standards, which would only hurt the environment. This path tries to gut unions and collective bargaining. This path has demonstrated a poor record on work environment safety, most particularly in the hazardous coal industry. Yup, don't need no gubmint tellin me coal ain't clean, we live to be well beyond 45 years old sometimes. Give me my welfare check and keep your gubmint out my life, I ain't got no use for them. Why is it that liberals hate blue collar industries? They preach about being for the little guy and yet the oil industry, coal industry, wood industry, tobacco industry, the meat industry and so on are all bad. Liberals want new clean technology but the teachers they protect so much stink. Were like 20th in the world in math. Makes no sense. Looks like the Democrats are willing to throw their union buddies right under the green energy bus! Good news is you have an alternative. Vote Republican, it's your only hope because the far left Democrat Party has painted a huge bulls eye on your back. That old ad wasn't Manchin taking aim at cap and trade, it was Obama taking aim at YOU. Let's raise EPA regulations so that we force coal out of business and all of our energy bills go up 400%, right Liberals? Just like you fixed Healthcare, right genius Liberals?? "Or vote for a Republican who will shut down OBAMA and not your job." I agree with the first part... it is all republicants have done for the last 6 years has been to try and shut down our duly elected President purely for political reasons. As for the' jobs' part, I doubt you are going to convince any person with 1/2 a brain or more that the republicants care one iota about their or anyone else's 'job'. They wouldn't know a 'job' if they were elected to do one. The only folks they would even care about in this equation would be the mine owners or the corporations which run them... an individual worker? Nah, not so much... if they had free reign, those Miners would be paying the corporations for the privilege to work in their mine unti lthey died... and that would be much, much sooner after they got rid of those silly regulations like lights, hard hats, fresh air shafts... all those silly old costly 'regulations'. You can bring a canary, but it has to be your own canary and you will have to pay 10 dollars a day for that privilege. If it dies... it will be 20. We will add it to the widow's bill along with the corporate body recovery fee. Hey Rudy!! NO job, NO union, NO collective bargaining, NO work environment!!! Yes, I agree NO BRAINER!! Vote to save your JOB West Virginia, and that will only happen if you vote Republican. Obama and the Democrats have already signed your death warrant and only Republicans can offer you a reprieve from their green energy at any cost insanity. How appropriate. Obama is trying to turn the lights out on this country. Keep voting for his Democrat minions and he will succeed. they think energy comes from obama. he is the provider. Natalie Tennant; it’s just the next Democratic candidate that has to run away from the Democratic Party policies and president Obama. There are more and more Democratic candidate that have to run away from their own Democratic Party policies to try to get reelected; too bad reelection won’t happen for them. We Democrats have our idiots too. Theatrics when we need action, nice . I liken this to your dog biting you when you try administering its life saving medicine. If she really believed in the coal industry she wouldn'g be a democrat. Just like Manchin lied to gun owners then betrayed them after getting elected, so is she lying to you to get elected. Sorry, but your gimmick wont get you elected. As long as you have a 'D' next to your name, people will see you as an endorsement for Harry Reid and his pseuo-socialist boss, Obama.